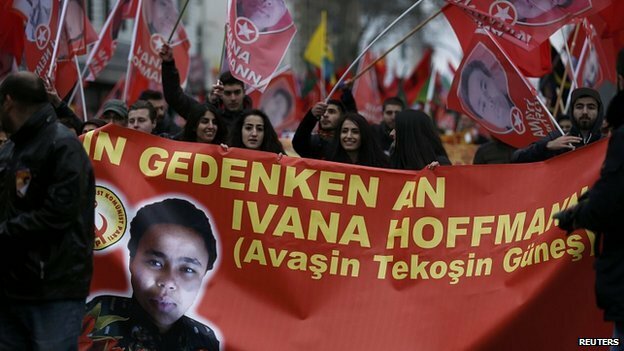 BERLIN (AP) — Some 2,000 people have attended a funeral march in western Germany for a woman who was killed while fighting with the Kurds against the Islamic State group in Syria. Police said friends and Communist activists escorted the body of Ivana Hoffmann, 19, through the city Duisburg to a cemetery where she was buried. Hoffmann died a week ago while fighting with the Peoples Protection Units, known as the YPG, near the Syrian village of Tel Tamr in Hassakeh province. Hoffman was born in Germany to a German mother and a father from Togo. She was a member of the Marxist-Leninist Communist Party (MLKP) in Turkey and joined YPG fighters about six months ago, the party said in a statement. The party said she died in clashes with IS militants. Artinya bebas diperkosa beramai2 dan halalan tayiban ya gan? RIP buat si cewek pemberani pembela kebenaran. biar digangbang dialam kubur make besi panas.